Hunting can be a great past time. The longer you do it, the more you’re probably going to accumulate additional hunting weapons. 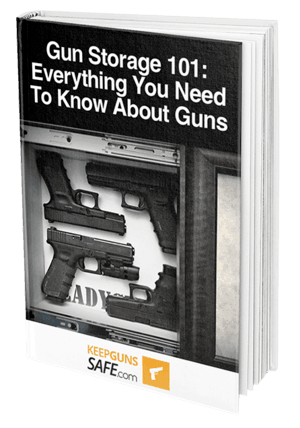 As your rifle and shot gun collection continues to grow, you’re going to need a safe place to store them. The Stack-On 16 Gun Steel Security Cabinet may be exactly what you’re looking for! In this review, we are going to talk a little more about the features of the Stack-On 16 Gun Steel Security Cabinet. You will get an overview of what people who have purchased the gun cabinet had to say about their overall experience with it. Then, we’re going to give you our recommendation on whether or not this cabinet is something you should consider purchasing to keep your weapons safe! The Stack-On 16 Gun Steel Security Cabinet has been designed to hold 16 rifles or guns., It also has a separate keyed storage space where you can hold an additional 15 handguns, jewelry, ammunition, and other valuables. If you’re looking for a versatile gun cabinet that belongs to our ​highly rated gun and rifle storage cabinets review, this is a great option that conforms to the California Penal Code Division 12088. This gun cabinet includes four large foam padded cushioned edges on the right side of the cabinet, as well on the floor of the cabinet to reduce scratches. The doors of the cabinet are individually locked, so you don’t have to worry about opening both doors to retrieve one item. The full-metal doorways are reinforced and feature a three-point locking system. 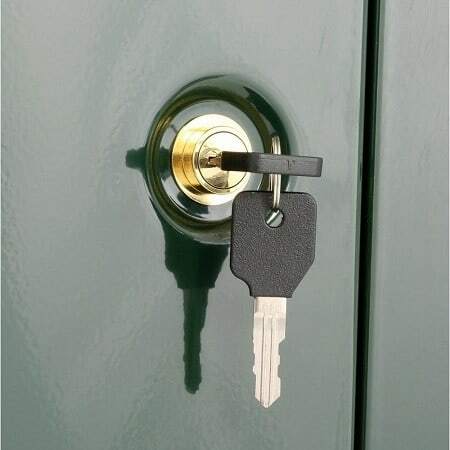 In addition, there is a key coded, double-bitted lock for increased security, preventing theft. If you are considering purchasing this gun cabinet, it is important to understand that it is not a safe and it isn’t undefeatable. Determined perpetrators who are armed with crowbars and a lot of time will be able to get inside. This gun cabinet is relatively lightweight, so you will be able to move and assemble it without any help. However, there are pre-drilled holes in the back wall of the cabinet. This allows you to drill the safe to the wall instead of bolting it to the floor, like you’d find with other gun safes. When looking at what people had to say about the Stack-On 16 Gun Steel Security Cabinet, the majority of customers were very happy with their purchase and left rave reviews. Of these reviews, customers commented on how much storage space this gun cabinet had, but also the ability to customize the cabinet to suit their needs. Customers also like that the complex locking system keeps children out for safety purposes and hinders theft. In addition, customers like that you can secure the safe to the wall, instead of the floor like other cabinets. 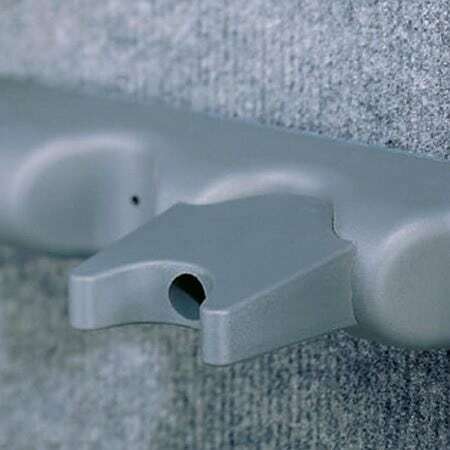 They feel that securing the safe to the wall makes it much more difficult for thieves. Customers appreciate the overall look and finish of the cabinet. They like that it is a decent size and it is capable of holding a lot of items. Several people commented that for the price, this is a great cabinet when you can’t afford a large gun safe, or a gun safe room. Although there were numerous positive reviews, there were some people who were not pleased with their purchase. Several customers were disappointed that the metal construction wasn’t thick and that with some work, a determined person could get inside. Some people also were annoyed because they needed a separate key to get in either door. Keep in mind, this is part of what makes the cabinet a little more secure than others on the market. Other customers complained there were problems with their cabinet. Some reported that the inner wall dividing the two sides wasn’t welded in straight, making it impossible to attach the shelves. Others complained they were missing keys or shelves. Several people mentioned the locking bars on their unit would not release the key, no matter what they did. Fortunately, this customer reported the door was open and nothing was locked inside. If you’re looking for a way to keep your guns, ammunition, and other valuables safe and out of the reach of curious children, then you will want something that is made from strong materials and has several different locking mechanisms. 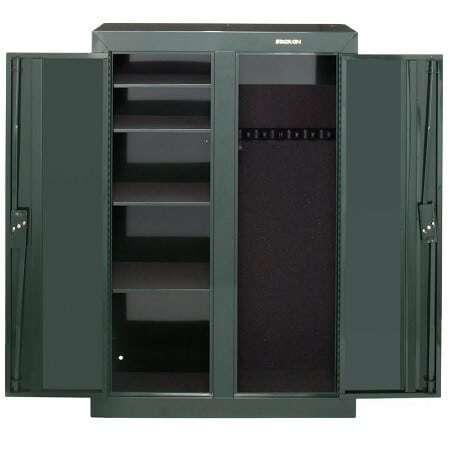 The Stack-On 16 Gun Steel Security Cabinet is an example of that. We like this gun cabinet because it is versatile and it is safe, without having the hefty price tag of a gun safe. This unit features a 3-point locking system, and a separate locking storage space for smaller guns, ammunition, and other valuables. We also appreciate that this gun cabinet is capable of holding an impressive amount of weapons - 16 rifles or shot guns. If you utilize the additional gun barrel rests, you can store an additional 15 handguns, making this cabinet capable of safely storing 31 guns total. If you want something that is going to keep children away from your weapons while keeping the weapons clean and organized, then we believe this is a great option worthy of consideration. If you find that this cabinet doesn’t live up to your expectations and there are defects in it, you can make use of the 1 year limited warranty!